Exeter Chiefs have signed Australia forward Dave Dennis on a three-year deal to start next season. 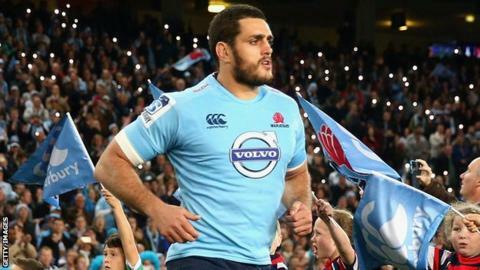 The 30-year-old, who can play at lock or in the back row and has won 18 caps for his country, will move to Sandy Park from the Sydney-based Waratahs. Dennis is the second Australian to sign for Exeter, joining prop Greg Holmes who is coming from Queensland Reds. He is the third major signing for next season after Bath fly-half Ollie Devoto also committed to the Chiefs. "I've had an unbelievable time with the Waratahs and I owe them so much for what I've done in terms of my career," Dennis said. "The opportunity, however, to try something new in Exeter was one I was wanted to do and having spoken to a lot of people about the Chiefs, all of them have been very positive and told me it will be a great move for me." Dennis has played more than 90 times for Waratahs in Super Rugby since making his debut back in 2007. "I've not made any secret of the fact that squad-wise we were probably a lock light this year, so we have been having a good look around," Exeter head coach Rob Baxter said. "We've known Dave has been available for a little while and obviously we have had a good look at the way he plays; how he's performed in the past and his leadership skills, and we think he will be a good fit for us." Former Exeter captain Dean Mumm, now a team-mate with the Waratahs, was also influential in persuading Dennis to make the switch. "Speaking to him he had nothing but positive things to say about the Chiefs and his time over in England," Dennis added. "He told me a lot of about the history of the club and the direction the Chiefs were heading in. "He also mentioned about how the club had a great academy system and how they had brought through a lot of the guys who are now starting regularly each week. I think that's important in any club to have local guys coming through and it's something we have done here at the Waratahs."